Shopping for a mortgage is a relatively straight forward process. You call up your local bank, a credit union, a mortgage lender, or a mortgage broker. Each one of those can do a loan for you. 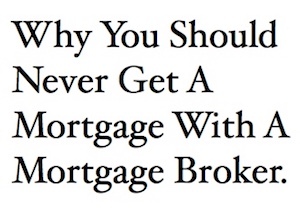 But I want to explain why you should never use a mortgage broker. Or at the very least, call the mortgage broker last. Lets get a few things out of the way. Mortgage brokers are not bad people. They are just trying to earn a living like the rest of us. A mortgage broker is a middle man between mortgage lenders (banks, credit unions, other mortgage companies, etc.) and the borrower. Mortgage brokers and the company they work for do not lend money. What they do is work with lending institutions (banks, credit unions, mortgage companies) and do the mortgage shopping for you. In return for doing the shopping they charge you a premium to do it. That’s it. This premium can be substantial to your closing costs to do the loan. If you have worked with a mortgage broker in the past or are working with one now go and take a look at the Good Faith Estimate and the line item that says “Origination Fee” or “Broker Premium.” That’s what you are paying them to shop. Origination fees are usually 1%-2% of the loan, i.e $100,000 x 1% = $1000 commission for them. As you can see this is some good money for basically talking to you for 20 minutes and picking a loan. Lets say a mortgage broker closes $1.5 million to $2 million in loans a month = $15k – $40k in revenue. Most mortgage brokers work in small offices with a few employees (secretary, assistant, etc.) who need to be paid along with expenses (rent, phone lines, etc.). The mortgage broker probably walks away with half of the revenue each loan makes as their commission. Most do not have underwriters and processors as those are taken care of by the company who is actually lending the money. Benefits – Mortgage brokers will tell you they provide a substantial benefit to the borrower a bank or mortgage company cannot provide. And that is they work with 25+ different mortgage companies and can find the best deal for them. From my experience working as a mortgage banker and competing against mortgage brokers for business I often found the mortgage brokers worked with the same 2 or 3 lending institutions even though they could work with 25 or more. Within those 25+ lending institutions there might be a handful that have a few unique loans or more flexible guidelines. In most cases they offer the same loans as everybody else. Now go ahead and ask the question to the mortgage broker. They probably won’t know what to say or have some line saying “that’s how we were able to get you a lower interest rate.” In which you could have been given the same rate by the bank funding the loan. You now know mortgage brokers and their companies do not fund the loans. All they do is shop your application around. You can save hundreds if not thousands of dollars in closing costs if you do your shopping on your own starting with phone calls to your bank, credit union, or a large mortgage lender. If you can get approved on a mortgage with one of those companies than move forward with them. Now lets say you can’t. Or you are in process with one of them and all of a sudden you get denied in underwriting. You have a purchase agreement and the closing is scheduled in 30 days. Or maybe you must do a cash out refinance to pay off debt to keep the house. The company you are working with will not close the loan because of one small reason. Lets say its an old tax transcript or something. They just won’t do it. This is when you call the mortgage broker. Reason being is they will take your application, the story behind it, and call their 25+ lenders trying to find one that will close the loan without the tax transcript. Maybe they find some small bank willing to accept the rest of your documents and will move forward without the one piece of paper. Your savior! If you can document your income, assets, and are a typical borrower than always make your first call to a mortgage lender, bank, or credit union. You will save money in closing costs and work with the company who is funding the loan. Its one less piece in the puzzle to close your loan. Only call a mortgage broker if you find yourself in a jam. In cases like that it might be worth to pay the 1% origination fee to them to shop 25+ places instead of you spending a ton of time doing it yourself. I had a friend who worked as a mortgage broker when I was a mortgage banker at Quicken Loans. We would share stories and of course how we were paid came up. For every one loan he closed it would take me closing five to equal what he earned. Now, I would talk to a lot more people and did a lot less work to talk to them as the company provided all the leads. He had to do all of that on his own. My prediction is technology will eliminate or drastically reduce the amount of mortgage brokers. Why can’t large mortgage companies and banks create the same connections brokers had and send loans over they are not comfortable in closing to a company that is. And in return they split the revenue. Or even provide some in-house benefit to keep the person with them while they get better at retrieving documents. Things like that. Mortgage brokers were everywhere during the refi boom and housing bubble. But that all changed and you don’t hear or see that many anymore. This article was written by someone who has never originated a home loan. They speak as if originating a home loan is done with an Easy Button: take an app, talk to the cust for 10 mins., then close & get paid big bucks. lol Ridiculous. The Broker represents the borrower like an attorney, presenting the case to the lender thoroughly to ensure approval. Unlike the bank, there is some flexabilty depending on how the broker presents the case to the lender. Furthermore, there are several factors that are out of the bank’s control and the broker’s control. The appraisl, re-pulling of the credit report, field review results, change in federal regulations, etc.. A good broker is worth every dime they’re paid and the work put into the file can be tremendous. The writer of this article should orignate and process a file with a borrower who’s credit score is 580 on a property in Georgia. lol They would then understand why the fees are so high. And finally, the loan originator rarely gets more then 50% of that fee. There are an office full of people (managers, processors, secretarys) who are getting a piece of that fee for doing the work to get the loan closed for the borrower. This article was written by somebody who worked at Quicken Loans for over 2 years. You described exactly how the process went for me as a mortgage banker there besides the big bucks thing. It may not have been Georgia but I have originated home loans for people with 580 credit scores. The fees are high because the borrower has a low credit score. If you read reason #1 you would understand that I am not bashing mortgage brokers at all.